The fake news media is at it again, and this time ACT for America is in their sights! In the last week alone BuzzFeed, the Washington Post, GQ, HuffPost, and countless other far-left media outlets have turned their attention on us. This is a Southern Poverty Law Center coordinated attack against our organization! They know that the work we do is crucial to defending our nation’s values, and they’re scared of our effectiveness at rallying the grassroots and passing meaningful national security legislation on the state and federal level. When President Trump said the fake news media is the “enemy of the people”, he knew they were only out to deceive us with their prejudices and political biases. Just yesterday, the national media outlet Roll Call libelously attacked ACT for America using the discredited Southern Poverty Law Center as their sole source of information to falsely paint us in a negative light. 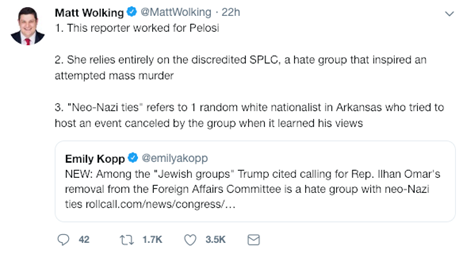 Their “journalistic integrity” included attempting to tie us to neo-Nazis, ignoring our comments, and labeling ACT for America as a hate group for supporting strong national security policies. The leftist Fake News media is out of control! Several political figures and outlets that know the great work ACT for America does came to our defense and called out the blatant lies, take a look! It’s clear that in the age of fake news and disinformation, the media cares more about destroying their enemies and advancing their political narrative than publishing the truth. Luckily, there are still patriots like yourself that are dedicated to exposing these outrageous lies and supporting organizations like ACT for America who fight tirelessly for the truth. We are willing to lead the charge, but we need your help raising funds to fight groups like the heavily endowed Southern Poverty Law Center. They have entire teams of dedicated staff members working to take down successful conservative organizations like ACT, but with you on our side, we know this war for truth can be won. Please consider clicking below to make a recurring donation of $15, $20, $35, or more towards taking on the fake news media and their leftist allies. Copyright © 2018. ACT for America, All rights reserved.